Poverty grips half of the population of Bicol Region in the Philippines. 50% of the workforce is dependent on the agricultural sector that is mainly small-scale and backward. With meagre economic resources, and regular exposure to extreme climate conditions, these communities are vulnerable to natural disasters. 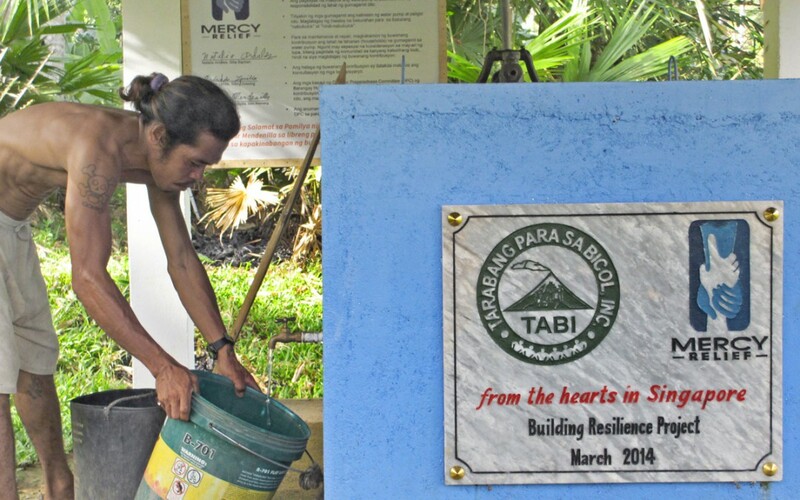 Seeing a need to assist those who struggle to recover from this constant bombardment of mother nature, MR collaborated with local partner Tarabang Para Sa Bicol Inc. (TABI) to initiate the Building Resilience Project in Jan 2013. The project aims to empower and equip disaster prone and low-income communities in disaster preparedness and disaster risk mitigation by improving infrastructure and introducing facilities with appropriate technology at an existing TABI demo farm to promote ongoing sustainable income generating practices. Over the course of a year, several activities were implemented, including the establishment of a Disaster Preparedness Committee to allow for a series of disaster preparedness training and hazard mapping preparation to be conducted. To ensure safer and uncontaminated drinking water for the communities, the functionality of a deep well was also improved with the installation of a hand pump and carbon filters. A group of Singapore Polytechnic Diploma Plus Humanitarian Affairs students also contributed to the project by participating in a Mercy Overseas Volunteers Expedition (MOVE) trip from 3-14 July. These students installed drip irrigation facilities, conducted hazard mapping and evacuation drills for the local community, and planted 200 mangrove propagules as a part of disaster risk reduction measure. Costing $115,000, the project was completed in April 2014 and benefited over 400 households. Following a disaster preparedness training session, participants were able to come up with a community hazard map and a counter disaster plan. MR and TABI staff with villagers who donated their land for the construction of the water source for community use. Villagers participate in an evacuation drill conducted by MOVE participants from Singapore Polytechnic. * MR has been implementing relief and development projects in five areas across the Philippines – Bicol Region, Metro Manila, Mindanao, Zambales and Visayas – continuously since 2006 as part of its disaster risk reduction efforts in line with the Hyogo Framework and AADMER. Click here to read more on “MR in the Philippines”.